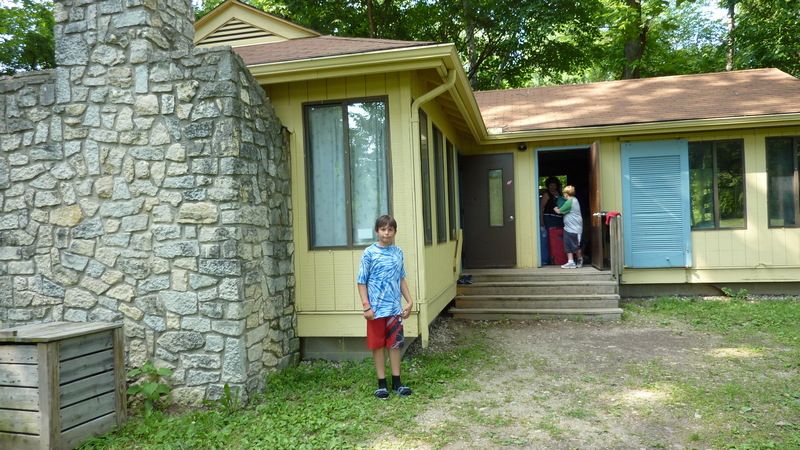 This summer, The Little One went to his first-ever overnight camp, five nights in a cabin in the woods. Swimming, archery, campfires, horseback riding, night hikes with the fireflies — this was the real deal, just as I always imagined camp would look like, based on the book settings and movie locations and my imagination. Since he was a first time Camper, I was the corresponding first time Camper Mom. I had a lot of questions. I knew I could be very brave. I read all the camper instructions on the website, packed the five t-shirts and five pairs of shorts, the bug spray and sunscreen, and labeled everything as he packed it into his stuffed duffel. The website said no calls and no visits all week, but we could write letters to our camper if we wanted. To have the letters delivered each day, they suggested we label each envelope with the day of week, and drop off all the letters at the camp office on Sunday. This presented a bit of a challenge, since it is harder to write newsy, interesting accounts of family events at home that have not yet actually happened. So I did what any self-respecting mother would do, and made everything up. One the eve of his departure, the boy’s biggest concern was not that he knew no one there, or the scary camp mashed potatoes, or snakes, or thunderstorms — his greatest fear was that his brother would have fun at home without him. Monday: begin knitting lessons for his brother. Lose satellite reception and have to resort to reading the dictionary out loud to pass the hours of mind-numbing boredom. Read and read and read until we make it all the way to the letter D. Watch the grass grow. Hope you are having more fun than we are. Tuesday: Continue to read the dictionary out loud, continuing late into the evening to make it to letter M. More knitting for your brother, as he tries to finish the sleeves. This is after he has to brush the dog’s teeth with the squirrel-flavored toothpaste. Wednesday: Celebrate reaching the letter R in the dictionary by eating only foods that begin with R all day: rhubarb, rutabagas, radishes — and that was just breakfast. Your brother has resorted to cleaning the litterbox with the dog’s toothbrush just for fun because he cannot find anything else to do. Thursday: after many hours of knitting, the sweater your brother is making for you did not “turn out right”. Maybe we can use it as a potholder instead. We finished the dictionary last night and we do not want to talk about how many hours it took. Friday: Can’t wait to see you tonight! We picked him up Friday night. He had the most exciting week of his life. He looked older, more confident. And he looked torn when we walked up, a simultaneous “I don’t ever want to leave this place”, and “I can’t wait to get back home.” He had been homesick, but he was brave. And, it turns out, after the emotional roller coaster of independence and activity, the unfamiliar and the fun, he was so mentally fried that he believed all the letters I had written were real accounts of life at home, that all the newsy news I shared had indeed happened. I felt a little guilty, but only for a moment. The end almost certainly justifies the means, not to mention that lying to my kids has been the cornerstone of my publishing credits. Perhaps the news of his brother’s boredom had soothed his soul during the dark hours of the night. I think the letters did make him smile, because he saved them and brought them home, damp and crumpled much like all the possessions that made it back into the duffel. Because I had a large pile of unopened mail on the counter for days, I found the letter he wrote to us FROM camp long after he returned. He did not even remember writing it. The note was sweet, written with a stubby pencil on the writing desk of his knee, slightly self-conscious and clearly trying hard to not think about being homesick. He wrote that the food was good and camp was fun. Then he signed it with his full signature, in case we were confused about which kid had not been home all week. Like I had not been sneaking into his room while he was gone and laying my head on his pillow to breathe the lingering still-sweet smell of little boy. Oops. Did I write that out loud? I missed him an embarrassingly ridiculous amount, which of course made this an invaluable experience for all involved. He had a great week. Separation is good, and reunions are so sweet. Great piece, Jane, about your son going to camp. I too must confess to occasionally sneaking into my kids’ room to breathe in that little boy smell…and my kids are still home with me all the time. So, I can imagine I’ll be in for a shock when they eventually go off to camp…and to life. Justine, I am so glad to hear that someone else does that crazy thing… I was afraid it was just me. 🙂 Good thing that it all comes in baby steps to get us ready for the next leap when it comes. Thanks, Kris. You are such a loyal reader and commenter. You keep me going! Oh, Jane. I haven’t said this out loud or even written it down until now. But my baby boy (24) is leaving for London in September for a one-year master’s program at The London School of Economics. He hasn’t even lived at home for the past four years, but he lives nearby and pops in ever day. I’ve only told friends about his acceptance into such a great school with joy and happiness for him (he did this all on his own!). I am proud, but my heart is heavy. Oh, so heavy that he is going so far away. So camp is a good thing. It eases everyone into the inevitable. They grow up one day. But even his travels when he played Southern Tennis, when he moved into a dorm, then into a house, only slightly prepared me for what is to come. But he is ready. And that is a good thing. Darrelyn, what an amazing opportunity for your son, and you must be very proud… and now my heart is heavy for you too. What a well of emotions this will be for you to draw from in your writing, but I am sure that is small consolation right now. There is something about an ocean — physically and metaphorically — that feels Far. With the capital F.
You are so right, summer camp is a good place to start!